Land Destroyer: "White Helmet" "Save Aleppo" Protest Proves How Easy it is to Dress Up Actors as "War Victims"
"White Helmet" "Save Aleppo" Protest Proves How Easy it is to Dress Up Actors as "War Victims"
October 3, 2016 (Tony Cartalucci - LD) - Recent protests held across North America and Europe staged by supporters of armed militants in Syria have staged scenes in Western streets eerily similar to those featured in the photos and videos of the US-European funded "Syrian Civil Defence" also known as the "White Helmets." 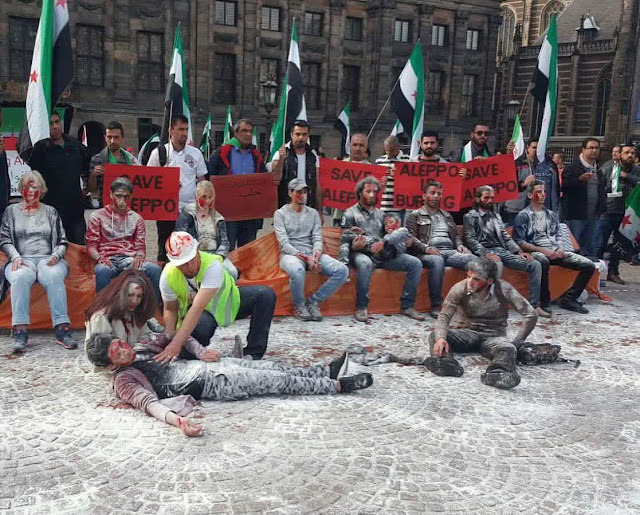 Image: This is not Aleppo, Syria, but rather the streets of Europe where a recent "save Aleppo" protest was staged. Actors posing in fake dust and blood proved just how easy it is for anyone to create "war victims" anytime, anywhere. The stalling talks between international powers on Syria - with Russia ramping up its air raid campaign - has ignited worldwide protests calling for an end to the horror in Aleppo. Protestors in Turkey, France, Netherlands, America and Canada took to the streets opposing Bashar al-Assad’s and Russia’s crimes in Aleppo, carrying posters that read “Stop bombing Aleppo” and “Save Aleppo”. Al Arabiya's ironic hand-wringing over Syria as Riyadh devastates Yemen with its own aerial bombardment and ground incursion, attempts to portray eastern Aleppo as a horrific cauldron where "where more than 250,000 civilians are trapped without food or clean water." And while undoubtedly war is raging in eastern Aleppo, it should be noted that the vast majority of Aleppo's population - 1.75 million in fact - live in the government-controlled majority of Aleppo. 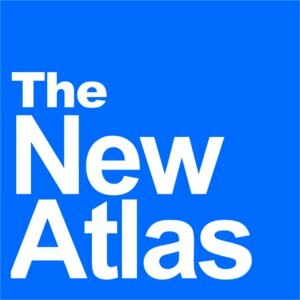 But despite this reality, the West and its allies - including Saudi Arabia - have attempted to use their sway over international public opinion to exaggerate Syrian security operations and fabricate a "humanitarian catastrophe" to serve as yet another pretext for wider Western intervention. Central to this appeal to public opinion has been the so-called "White Helmets," also referred to as the "Syrian Civil Defence" despite the nation of Syria already having a legitimate, professional civil defense force. Posing as an impartial rescue force, the "White Helmets" are transparently auxiliaries serving exclusively side-by-side armed militants including US State Department, UN, and EU designated foreign terrorist organizations. Their primary function is not "rescuing" anyone, but to manage a public relations campaign aimed at swaying public and political opinion, leveraging "humanitarian" sympathy worldwide. 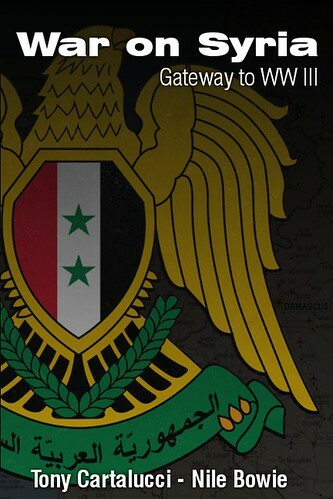 Their primary means of doing this is publishing photos and videos of their members - wearing elaborate, matching uniforms and driving brand new ambulances - pulling dust and blood covered victims from rubble allegedly brought down upon them by Syrian and Russian airstrikes. The veracity of their photos, videos, and many claims have never been independently verified, and in many cases, evidence suggests that much of what they present to the public across their extensive, well-funded social media presence has been fabricated. The recent coordinated "save Aleppo" protests held across Europe and North America, perhaps revealed just how transparently fabricated and fictional the "White Helmet's" work really is. During one protest, photos retweeted by the official "White Helmet's" Twitter account showed actors dressed up as "war victims," covered in fake dust and blood, appearing almost indistinguishable from the alleged "victims" the "White Helmets" regularly "save" in Syria. 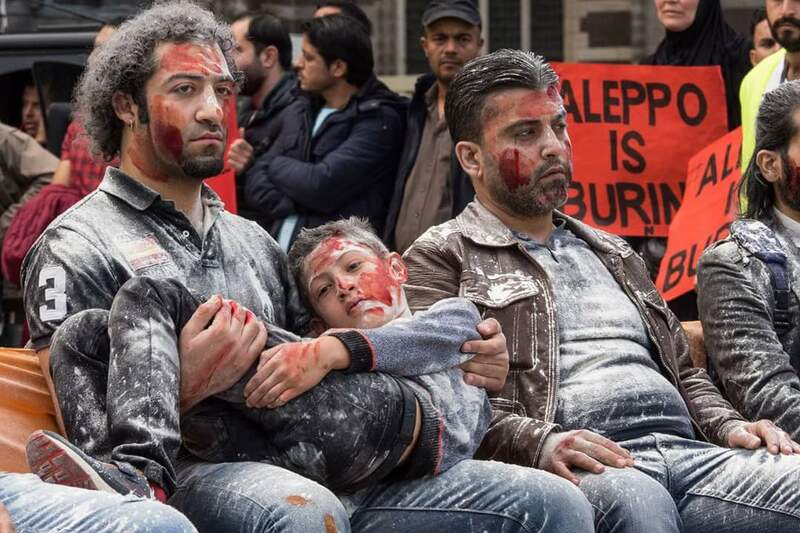 The protest, staged in European streets far from the Syrian conflict, even included children - likewise covered in fake dust and blood - cradled in the arms of adults, posing with despondent looks upon their faces. Also part of the staged scene were actors dressed like the "White Helmets" themselves. Image: The only difference between admittedly staged scenes in European streets during a recent "save Aleppo" protest, and the daily output of the Western created and funded "White Helmets" acting troupe in Syria is that in Syria, the devastation of war provides a much more convincing "set" for the actors to perform on. 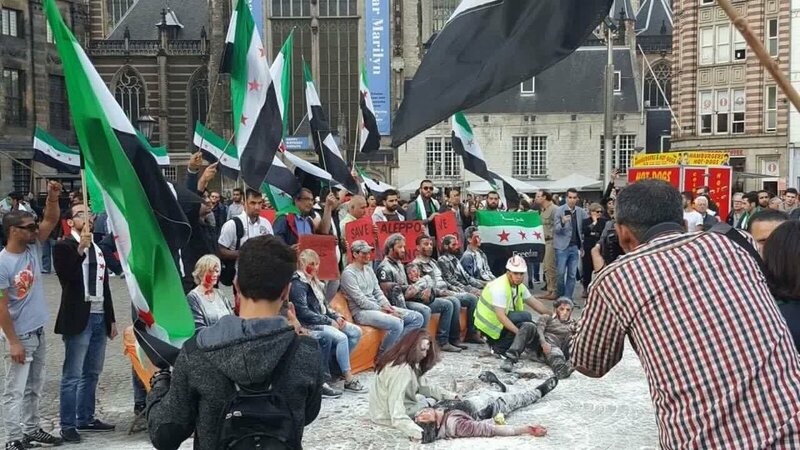 While the acting troupe that organized this protest may have thought they were cleverly "bringing the conflict to the streets of Europe" to invoke global sympathy for their cause, what they really proved was just how easy it really is for the "White Helmets" to create "war victims" anytime, anywhere. In Syria, where years of US-backed violence has left many parts of the country devastated, such staged scenes playing out with the devastation of war as a backdrop become all the much more convincing. 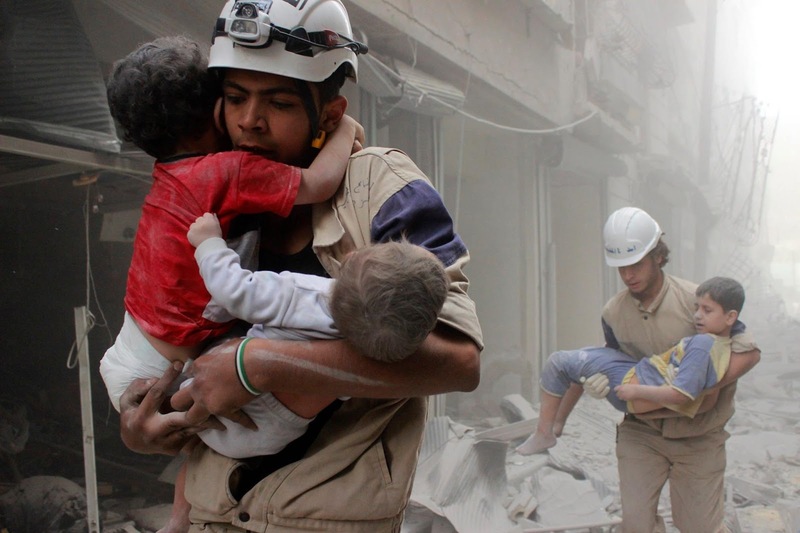 With "White Helmet" videos heavily edited before reaching the public, they are able to create tragic scenes of war, anytime, anywhere - even in the streets of Europe thousands of miles away from where Syrian and Russian warplanes are operating. Their primary goal and that of the special interests funding them tens of millions of dollars, is to manipulate the hearts and minds of the global public in support of Western-backed armed militants - not "save lives" nor bring peace to Syria.